I'm not sure exactly why, but I've always had a bit of a fascination with things that have a punctuation on them. I'm got an ampersand and atmark figurines as well as an ampersand pillow. 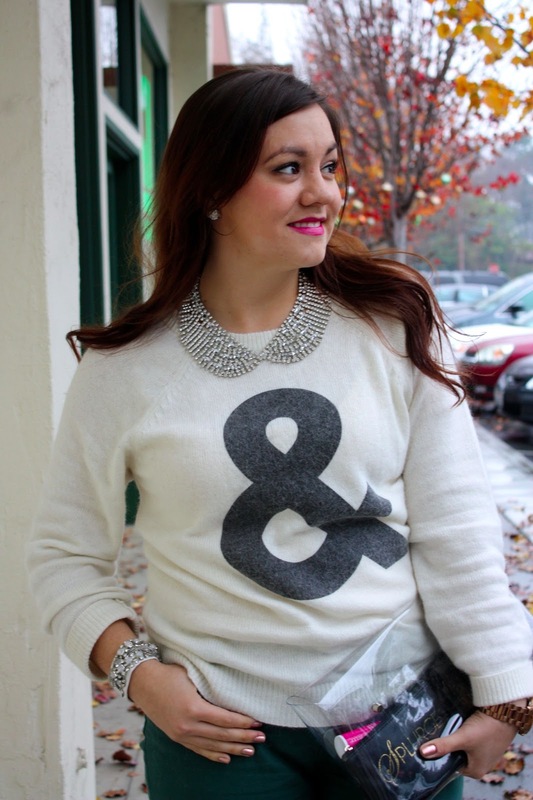 So when I spotted this ampersand sweater, I had to have it! And even though it sheds worse than any cat I've ever held, I love it! For it's debut, I paired it with my new emerald cap-toe pumps forest green skinny jeans. I donned sparkles around my neck and wrist then carried the clear clutch I made. And because I've always loved the fuchsia paired with green, I swiped MAC's Spitfire on to my lips! I think I saw a photo of you in this sweater on the PM Instagram and I really liked it! It's one of my favorite symbols as well (probably because it looks like a backwards cursive S, haha) and I really like the color of your lipstick with the dark green pants! Super cute! And dying over the fact that you made that clutch...did you do a tutorial?? I love everything about this outfit! I have a pair of green pants similar to yours and now am inspired to style them in a similar way. That clutch too is awesome, I'm on the hunt for a good one like that :) pretty as always! That first picture literally took my breath away. 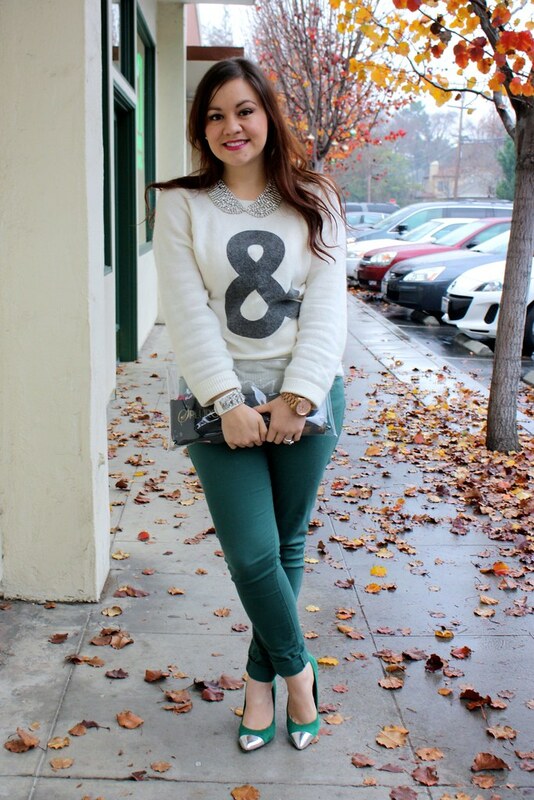 So flattering, and I love the pairing of the sweater with those jeans and those jeans with those heels. Fantastic. Was waiting for these heels to make their debut on your blog! I knew they would look so good on you! Beautiful outfit, beautiful sister. I've said it before and I will say it again: I am loving your natural hair color as it grows in! Love this! Loving the clear clutch though, which i think is so fun! So funny I saw this sweater over the weekend and thought how it looked like J Crew and not like F21 :) Love the necklace you paired it with! Love this! We are mind twins. I almost purchased this sweater and I have those shoes! Loving your collar and clear clutch. Well done, lady! It's really great quality! F21 is really stepping it up! Thanks, Amy! Well... you actually sent the blue ones, which I plan to wear soon, but I had to go look for the purple ones at my Target when yours didn't have my size. I didn't have luck with the purple, but for $10, I couldn't help but scoop up the green! ;) Thanks for thinking of me! And thanks for the comment about my hair! I keep feeling like it's so blah and drab, but you always cheer me up! Love ya! I didn't! I followed someone else's tute a while back. You sure did! Thanks, lady! that. sweater. is. amazing!!!! SO CUTE! 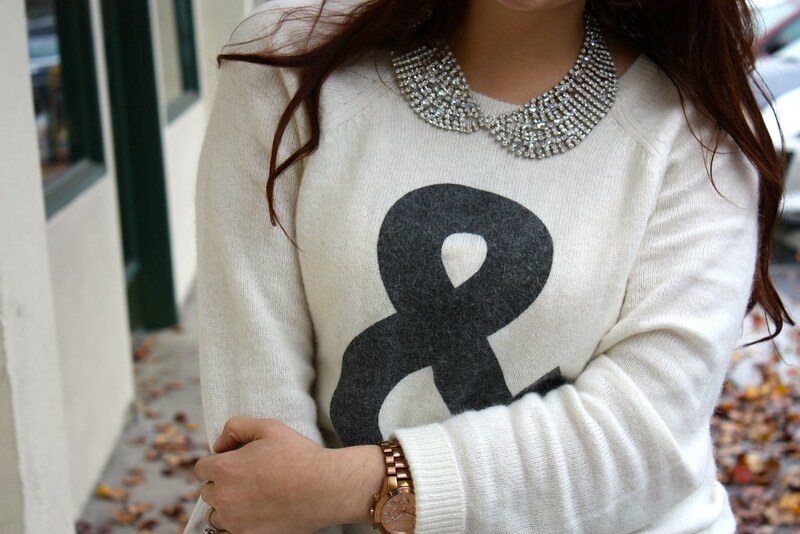 Such a cute sweater! and love those pants! I have a Hermes silk scarf giveaway on my blog, would love for you to pass by and enter! Love this look. Such an adorable sweater. i'd like the entire outfit please! such great styling! Absolutely adore this outfit!! I should have gotten that sweater-it's too fun. And the green pants with the green shoes is perfection. Aren't those shoes insanely comfortable! Love mine! It's still available--get it! ;) They're surprisingly comfy! Love that sweater and that green is awesome! I have green eyes so I try to wear green as much as I can! You look gorgeous!